After months of promising we have finally moved Exadel Flamingo to exadel.org and released version 2.2.0. exadel.org is our community site for hosting open source projects. 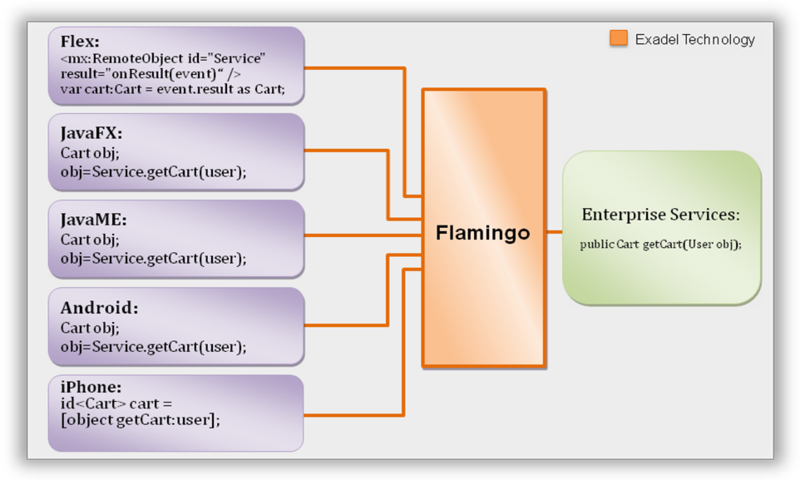 Flamingo is a light weight framework for connecting rich web and mobile user interfaces to enterprise back end. Version 2.2.0 is updated with Hessian 4 and JavaFX 1.3 support. As you can see from the image above, no matter what client you are using, invoking a method in your enterprise applications looks very similar which allows for great reuse. The following are good resources to get started or learn more about Flamingo. Check out the recent Enterprise JavaFX and Seam series. This series shows most server integration features in separate post and easy to follow examples. We want to hear your feedback, please use project Jira or the forum to report bugs or any features you would like to see.